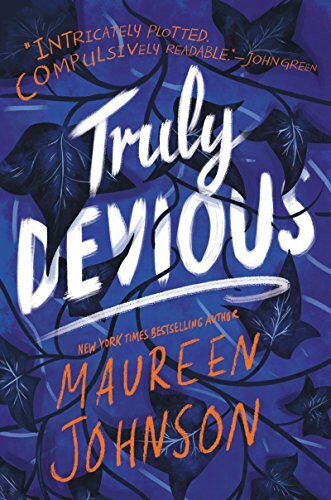 Description: New York Times bestselling author Maureen Johnson weaves a delicate tale of murder and mystery in the first book of a striking new series, perfect for fans of Agatha Christie and E. Lockhart. My Thoughts: This was an excellent mystery whose only flaw was the cliffhanger ending. I want books two and three RIGHT NOW. Stevie Bell has been accepted at the Ellingham Academy in rural Vermont. The school was founded by a tycoon in the 1930s to provide a free education to students from a wide variety of backgrounds and with a wide variety of interests. Her housemates include and inventor, a novelist, an eccentric artist, an actor, and a character steeped in mystery. Stevie wants to solve mysteries and the one most on her mind is the kidnapping and disappearance of the school founder's wife and daughter in 1936. While the wife's body was found, the child's was not. Stevie has read all the books about the mystery. She has gathered thousands of pages of research including court transcripts, FBI interviews, and newspaper clippings. She is glad to be at the school and away from the parents who don't understand her and who support a political candidate she can't stand. The curriculum caters to her interests and she is kept busy with schoolwork and the day to day activities of a boarding school. Stevie is worried about the usual things: fitting in and making friends. Stevie also suffers from anxiety and takes medication to combat panic attacks. These things all fit in around her research. When Hayes, the actor, comes to her and asks for her help recreating the kidnapping, she pulls in Nate to do the writing while she provides the technical details. They gather together with other friends to produce a video. But then Hayes dies in one of the tunnels that riddle the school. Was it a tragic accident? Or is there a new murderer stalking Ellingham Academy? I loved the writing in this book. The story was descriptive, lyrical, and often sort of creepy. Stevie is a great character who sometimes gets so focused on crime solving that she neglects the people in her life. David was a fascinating character who provides quite a puzzle to Stevie even as they begin a tentative romance. Fans of mysteries, boarding schools, and romance will all enjoy this story and be eager to find out more when books two and three are available.